Translations by Randall Crossman, Lee Darnell, Till Dumke, Niall McNamara, Austin Smith and Charlie Wood. Introduced and edited by Austin Smith. A map showing the extent of the bombing on July 4th, 1945. 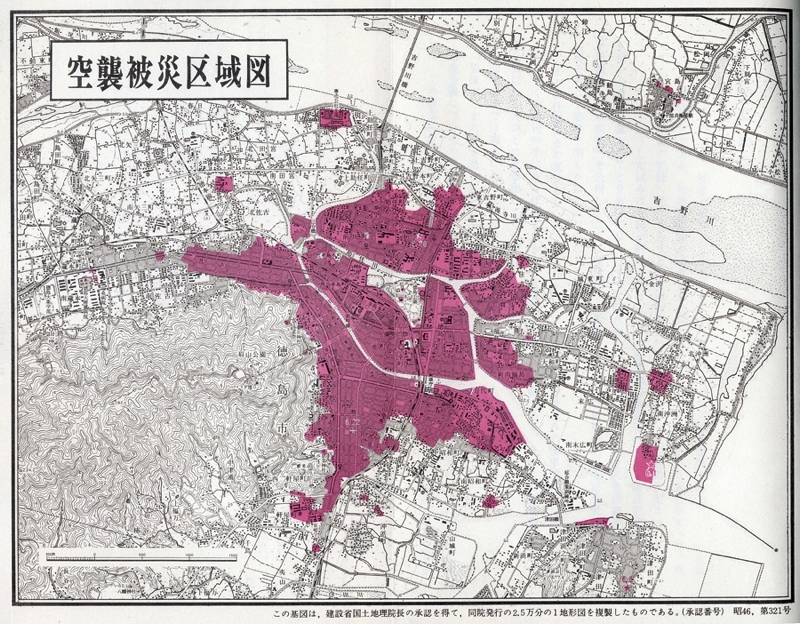 This collection of fifty-nine personal accounts of the Tokushima air raids was compiled by the Tokushima City Government to mark the 65th anniversary in July 2010. At that time, it was estimated that seventy percent of the population of Tokushima had not experienced the war firsthand. It is hoped that personal records like these serve as a lesson to younger generations so that tragic events of the past are not repeated and they can live in peace. This project aimed to provide English translations of these accounts to mark the 70th anniversary of the Great Tokushima Air Raid (4th July 2015). These accounts are seen as the ideal complement to the photographs and descriptions provided in the Tokushima Air Raids Digital Archive which was translated to coincide with the anniversary in 2014. These accounts were translated voluntarily by a group of JET Programme participants living and working in Shikoku at that time. These accounts cover a broad spectrum of experiences from across the Greater Tokushima area. The contributors provide an insight into the lasting trauma caused by the air raids and subsequent war defeat, some were just children at the time of the bombings. Information about each account can be found below followed by the full text. The names of the authors are listed in the Japanese style with surnames followed by given names. Summaries of each account have been provided to make the collection easier to navigate and process. Clicking on the title of these accounts will bring up the full text in PDF format. This account recalls the bombing of Akita-machi on June 22nd, 1945. This event was reportedly the first daylight bombing of the city. Takagi Kiyoko recalls how, until the first bombings, people had felt relatively safe in rural Tokushima. She tells of how her grandfather had told her family to meet at the shrine of a local god if they were separated. Haraguchi Mieko studied in Tokushima and lived in a dormitory. She fled the bombing with her teachers and classmates and followed the train tracks back to her hometown the following day. This is an account of the bombing of the Kuramoto Barracks on the morning of July 24th, 1945. Seo Masami spotted the bombs being dropped and used his experiences in Osaka to save the lives of his comrades. Tominaga Miyoko had thought the worst was over when the first air raid sirens stopped. Her pregnant mother ran into a glass door while trying to escape the subsequent air raid and suffered a miscarriage the next day. Izawa Chiyo was a third grade student at Jogakko, an all-girls school in Tokushima (now Joto Senior High School). She was an evacuation assistant and helped the first grade students when the air raid alarms were sounded during school time. She was due to begin work at a munitions factory in Suketo on July 4th. This account tells of the evacuation procedure in Nyuta, an area in the western part of Tokushima City. Yabe Yukiko rescued her neighbour’s sons from the bombs. Hayashi Nobuyoshi was seventeen years old at the time of the bombings. This is his account of the bombings in the Tsuda area of Tokushima City which took place in November, 1944, and June, 1945. This account reveals the extent of local cooperation in Tokushima – neighbours would provide intelligence, escape strategies and support to each other. Fujii Takaya was told to escape to the river based on intelligence from Okayama, a tactic that proved fatal to those in Hiroshima following the atomic bombings in August of the same year. Fukushima Keiichi contracted acute pneumonia and was bedridden because of overwork and malnutrition. This acounts tells of his dramatic escape with his mother and being reunited with his siblings at Kasuga Shrine. Miyagi Issei contrasts war-time, post-war and modern attitudes in this reflective account. Despite the hardships faced, he looks back fondly at the sense of patriotism and community spirit. Sato Akira vividly recalls both the bombing of Akita-machi and the Great Tokushima Air Raid. This account details his escape in both instances and the losses suffered in his neighbourhood. This account tells of a family’s escape up Mt.Bizan on July 4th, it is a tale of “fortune amidst tragedy” as Suzuki Kinuko’s two elder brothers had died fighting in Saipan and New Guinea. Nakanishi Miki’s father was a public servant who refused to evacuate to higher ground, he insisted on heading to the Prefectural Office. They hid together in an air raid shelter nearby while the building burned in front of their eyes. Yamada Sachiko recalls being saved by an unknown soldier on the banks of the river. She contrasts the scenes of death and destruction in the aftermath of the air raid with Japan’s remarkable post-war recovery. Miyamoto Tomiko lived along the banks of the Shinmachi River in Aiba-cho. Her account recalls her escape to Nikenya which was guided by the neighbourhood association. This account comes from Itano, an area 20 kilometres from the city centre. The author recalls the weeks prior to the bombing, the night itself and the aftermath. She was just seven years old at the time. Sakamoto Yuko was five years old at the time of the air raid. She is the youngest contributor to this collection. Her home in Okinosu was destroyed by the bombing, leaving a family of seven homeless. Hirano Akihiko lived in the Fukushima area of the city and was a third grade student at the old Tokushima Junior High School. As so many men had been conscripted he was made a leader of the neighbourhood association and risked his life trying to fight the fires before fleeing to safety under the Sumiyoshi Bridge. Furukawa Yoshiyuki now lives in Nara Prefecture but at the time of the air raid he was a fifth grade student at Uchimachi Elementary School. This account tells how his family of nine desperately tried to keep cool and keep the smoke out of a waterlogged shelter before escaping to Wakimachi in the days after the air raid. Okada Yukie was a first grade student at Jogakko (now Joto Senior High School), she helped her mother, grandmother and younger brother evacuate on the night of the air raid. After being burnt out of their home they stayed with the Hata family, who were housing thirty-one people under one roof. Fukawa Hisako remembers the bombing of Akita-machi on June 22nd as the first time she had felt fear. On July 4th the air raid shelter she had helped build was hit by a firebomb and she fled with her family to fields behind an elementary school. This account comes from a member of Tokushima’s Special Attack Unit who observed the air raid through his telescope before rushing into the city to try and locate his relatives in Dekijima-honcho. This account tells of an escape from Dekijima-honcho to the rivers around Tokushima Park after a bomb exploded next to a large air raid shelter. Uematsu goes on to describe how he had to re-educate himself in the post-war years after being indoctrinated during the war. Three generations of this family lived in Manchuria during the late 1930s and early ’40s. Imajiri Yuko returned to Tokushima with her brother early in 1942 to live with her retired grandparents while her parents remained overseas. She guided her grandparents to the safety of an overgrown playingfield during the air raid. Ogawa Kayoko was from a family of sword makers. Her father was the town’s air raid defence chief and he died in a bunker with seventy swords at his side. This account attempts to capture the sights and sounds of the air raid and its aftermath. Miyata Haruko hid in the Teramachi cemetery with her mother on that night. Yoshizaki Hiroshi was living in Minami Shinmachi at the time of the air raids, her family had fled to Tenjin Shrine on previous nights but on July 4th the shrine was ablaze and her family were separated. During the air raid Suzaki Hideichi’s grandfather and father debated whether they should evacuate or stay and protect the family home. The flames became so intense that he could only escape through the backdoor. He ran through Sako and Tamiya before reaching the banks of the Yoshino River and looking back to see Tokushima in flames. This account describes the community fire drills that included target practice and bucket relays. Kujime Miyoko’s family were separated during the air raid as her father had stayed behind to fight the fires while her grandfather had taken care of her brother. Takano Shinichi was just a child bailing groundwater out of an air raid shelter when bombs were dropped on Akita-machi on June 22nd, 1945. His family had no electricity on the night of July 4th so they could not listen to the radio for air raid warnings. Yamagumi Toshiko lived with her officer husband in Sako, when the fence next to their air raid shelter caught fire they escaped to Sako Station. A group of thirty people were waiting and her husband led their evacuation from there. This account tells the story of a family who successfully worked together to extinguish a fire in their home after a single firebomb struck their house. As the title suggests, Sakabe Miyoshi had a close escape on the night of the air raid as a firebomb whistled past her head and into a rice paddy. Her house was destroyed but she managed to safely locate her family one by one. Kashiwagi Shigeo lived with his mother in Sakae-machi. He was told not to flee to Inbe Shrine on Mt. Bizan and instead hid in the Gozabune River. This account mentions how he had been brainwashed by the military into believing Japan would be victorious. Yuasa Kimiko lived in mountain village in Anan and saw the red sky over Tokushima from 30 kilometres away. This account gives a more general insight into what life was like for a woman on the home front and Tokushima in the aftermath of the air raid. Konishi Hisako’s family returned to Tokushima from Osaka after their home was destroyed in an air raid only to suffer the same fate in the bombing of Akita-machi on June 23rd, 1945. Her father died in that bombing and her uncle was seriously wounded. Mima Jun’ichi recalls being aware that Japan’s defeat was approaching despite government censorship. He witnessed his mother being killed instantly after she was hit by an incendiary bomb on July 4th, 1945. Saijo Shiro’s elder sister was hit by a bomb while evacuating and suffered severe wounds to her thigh. Her father was an army surgeon but could not save her life as he did not have access to tetanus or anaesthetic. The title is a reference to Beethoven’s “Moonlight Sonata”. Yuasa Yasuharu was working as an air defence patrolman on top of Mt. Bizan and witnessed a large number of people that had been killed by a direct hit as they tried to make their way up the mountain. When dawn broke he went down to assess the damage. This account comes from the daughter of a local business owner who was drafted to work at a munitions factory making breathing apparatus for pilots. She could only watch on from the banks of the river as the factory was hit on July 4th and became a “flaming hell”. Sixth grade Uchimachi Elementary School student Tanaka Masayo hid in the bottom of a wooden boat anchored in the Fukushima River with her mother and two siblings. Her father was a member of the Uchimachi Civil Defence Unit. Ihara Fujiko and her younger brother became separated from the rest of the family as bombs fell on all sides. They were ultimately reunited, as the title suggests, after spending the night hiding in a river surrounded by corpses. This account comes from the Hachiman area of Tokushima, in the day after the air raid Otaki Kiyoko witnessed a procession of battered and exhausted city folk making their way along the mountain roads to stay with relatives in Ichinomiya and Kamiyama. Deguchi Hisako was volunteering in a bank on July 3rd when she was warned of the imminent danger of an air raid. On her way home she was told that Takamatsu had been bombed the night before. She escaped to the banks of the Yoshino River and describes the scenes as a “hell on earth”. This accounts recalls the bombing of Suketo on June 26th, 1945. Suketo Elementary School’s air raid shelter was hit and all the teachers and children inside were killed. Tsutsui Toyosuke’s mother worked at the school but had returned home when the air raid alarm sounded. He was evacuated to Nyuta before the Great Tokushima Air Raid. After being separated from her family Yagi Yoko escaped alone to Mitsuai-bashi (a three-way bridge between Minami Tamiya, Dekijima-honcho and Naka Maegawa-cho). She saw her family business burn to the ground from the bridge before being reunited with her parents and siblings. Her husband died in 1994 on the anniversary of the air raid. Matsubara Kiichiro was seriously injured while working as a mobilised student and was hospitalised at the time of the bombing. He was carried to safety on his sister’s back before being found by his father in the grounds of a temple. Following the bombing of Akita-machi, Gotoda Tomiko searched frantically for her mother and siblings amongst the dead and injured. Her mother and sister were seriously injured and her brothers were evacuated to the Iya Valley. She survived the Tokushima Great Air Raid by jumping into the Shinmachi River. This account focuses on the months following the air raid and war defeat, Hashimoto Tomio stayed in a temple with many others who had lost their houses. Malnutrition was rife and he frequently had to help bury the dead as the cold winter months set in. Ogura Kenji recalls how his uncle’s experience of air raids saved his life. The two of them ran from the flames rather than trying to put out the fire or find shelter from the bombs. Takemiya Etsuko tells of her escape from an air raid shelter with her younger brothers after becoming separated from her grandmother. Uono Tadahiro was a second grade student at Uchimachi Elementary School at the time of the air raid. Her family’s home and clock business were destroyed by fire and they faced a 30km walk to stay with relatives in the aftermath of the bombings. Kojima Tadayoshi tells of sheltering from the July 4th air raid at Iga-machi Hachiman Shrine and of an earlier bombing that sent shrapnel through the walls of his family home. Kawahito Tetsuro escaped through the park and hid in a tunnel leading to the Suketo River. He came across a number of dead bodies in the old sports stadium and salvaged a blanket and a lunchbox he found amongst them. Shigeru Yukio was fourteen years old at the time of the bombing and lived in the Sako area of Tokushima City. Her account tells of her escape and the aftermath of the bombing. Miyamoto Hiroko was eight years old at the time of the air raid, her younger sister was lost that night and never heard from again. This account was submitted in the hope that someone would have information about what happened to her, her name was Miyamoto Sawabi. Yoshikawa Taiji was carrying out repairs to telephone lines on the top of Mt. Bizan when the Kuramoto barracks were bombed. He was sent down to assess the damage and describes the scene of destruction in this account. Nishi Miyo’s 18th birthday was on July 3rd, 1945, her account tells of the apocalyptic scenes in the city that night and her escape along the Yoshino River to the relative safety of the Iya Valley.